Hello and welcome to the first entry of OriginalCinn. I am so new to this whole concept but I’m really going to try to make this experience full and wonderful and I’m really excited at what kinds of sweet things will come out of this. Today I made Banana Doughnuts. 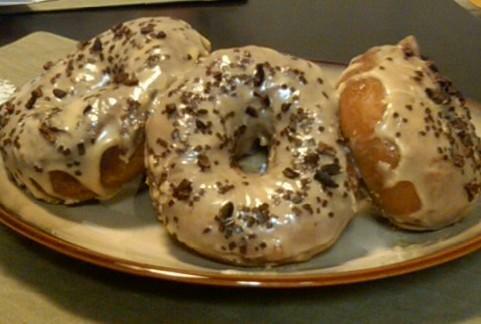 I found this recipe on Tartelette’s blog and I wanted to make it a little differently to suit the taste of my Love, T. Thus came the idea of Banana Bread Doughnuts with Peanut Butter Glaze, Chocolate Sprinkles and Cocoa Nibs. The doughnuts are flavored with cinnamon (of course), nutmeg, just a pinch of cardamom and honey and topped with a Peanut Butter Glaze. They were easy to make and even easier to eat. I think the hardest part was trying to keep the oil temperature regulated on my electric stovetop. These were not yeasted doughnuts, but more of a cake texture. I think next time I will make them all into little bite-sized doughnut holes. The dough was a little on the soft side and I think scooping them with my little ice cream scoop would have not only have made them small and cute, but more like a sweet snack. I will try to have recipes available soon. Hi Mariel! These look so yummy. T is the luckiest girl in the world!